3 World Trade Center (also known as 175 Greenwich Street) is a skyscraper under construction as part of the rebuilding of the World Trade Center site in Lower Manhattan, New York City. 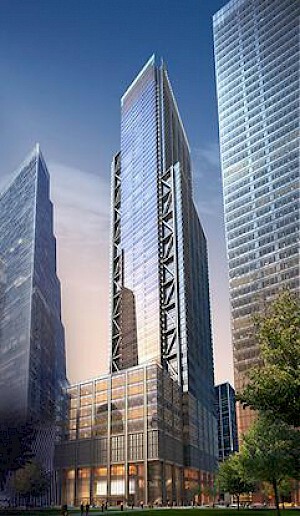 The project lies on the east side of Greenwich Street, across the street from the previous location of the Twin Towers, which were destroyed during the September 11 attacks in 2001. Pritzker Prize-winning architect Richard Rogers, of Rogers Stirk Harbour + Partners, was awarded the contract to design the building, which will have a height of 1,079 ft (329 m) tall with 80 stories. As of August 2016, the building's concrete core is topped out to maximum height, with the perimeter steel structure topped out on October 6, 2016. The building is slated to be completed in 2018. Marriott World Trade Center was previously located at the address until its destruction in 2001. It was a 22-story steel-frame hotel with 825 rooms. It had a roof height of 242 feet (74 m). Construction began in 1979 and it opened in July 1981 as the Vista International Hotel.